I am delighted this week to welcome Naomi Bulger to my blog as part of my new series of posts about the stories behind gorgeous Instagram accounts. You can find Naomi's blog here and her Instagram feed is naomibulger. Hi Naomi and welcome. Please scroll back through your Instagram feed to that first ever photograph. When did you post it? Well THAT sure was an interesting journey back in time. My first Instagram photograph was taken on 20 July 2011. Terrible! Lots of inane photographs, heavily saturated and filtered, with borders that made them even worse. Pictures of our pets, food at cafes, events we attended, and attempts at ‘arty’ close-ups. 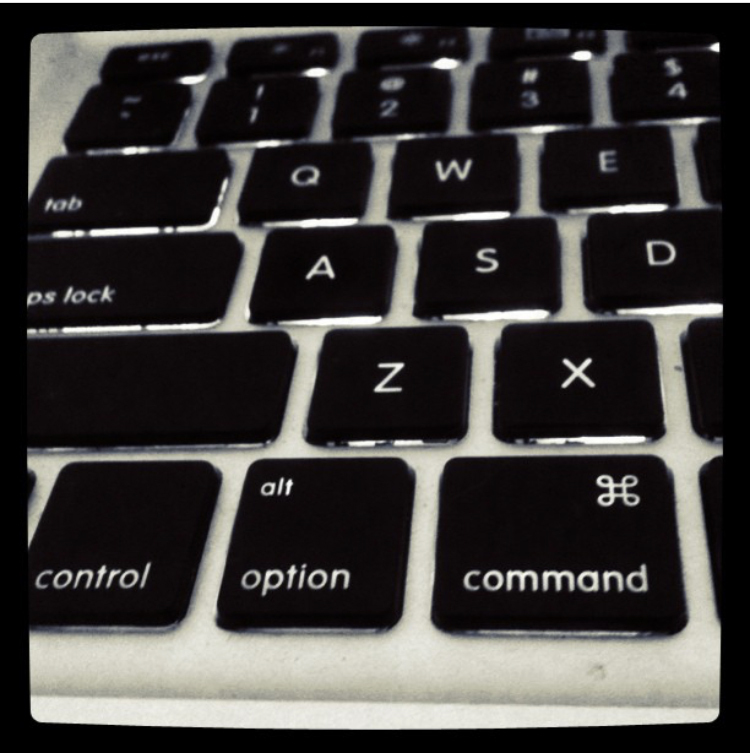 I cannot for the life of me think why I took, let alone posted, a partial shot of my computer keyboard, made even worse by filters and borders. I suspect I wasn’t thinking at all. I do remember why I joined Instagram. I’d seen these nostalgic, 70s-style photographs appearing on blogs at the time, and (so help me), thought “I want to do that too.” I joined Instagram for the filters, and pulled what I felt were the best of all the shots I’d taken to then use on my blog. At the time I didn’t even understand it was a social media platform, and hadn’t realised other people could see my photos until one day someone hit “like” or “follow” and I thought, “Who are they and where did they come from?” Then I had to figure out how to make my feed private, and it stayed that way for several years. I’m glad you asked me to look back through these old photos, though, because it showed me what I was subconsciously doing at the time. I was newly married, and had just moved back to Australia from New York. We were living in the northern half of Australia, and I was very unhappy there. I had no friends, we were out in a 10-year-old suburb (a sea of identical McMansion houses and roundabouts with no shops or community in sight), and I hated the weather: hot and humid all year, with no real seasons. Looking back at these terrible photographs, I can remember taking them to try and make peace with where I was living. To find beauty (through terrible composition and worse filters) in a landscape and lifestyle that wasn’t where I wanted to be. 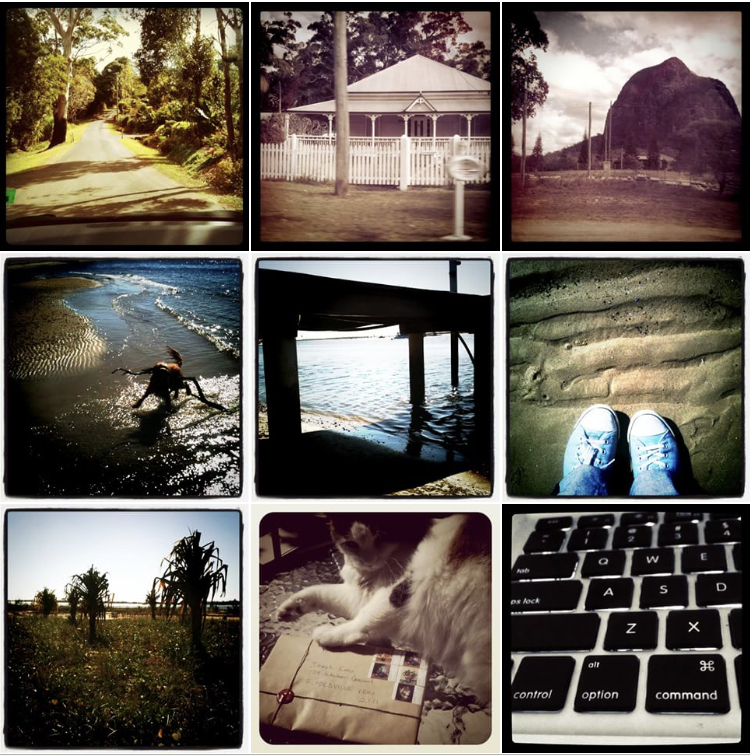 Later, as I settled back into life in Australia and we moved to a city where I was much happier, Instagram became a place where I’d document the little things in my life. Craft I was making, places I visited, and a whole lot of baby photos after I had my own children. Botanical and crafty, celebrating slow and simple living. A lot of nature, illustration, snail-mail, and tea. I use Instagram very differently nowadays. Most obviously, I’ve been trying to improve my photography and ease back on the filters and borders! But behind that is a bigger emotional shift. These days my Instagram feed shows the things that genuinely bring me joy, rather than the things I feel I ought to appreciate. As my children have grown, despite the fact that they continue to bring me more joy than anything else in my life, I share fewer photographs of them. I don’t want them to look back and feel that every little moment of their lives has been published on the Internet forever. I do also think a lot more about the people who are looking at my photographs and following my account, and what they see. I share the creative work I’m doing, and moments in my life that bring me joy. It’s genuine work and they are genuine moments, but I am a lot more considered about the way I present them, thinking about things like light source and white balance, and varying the images so there aren’t too many that are all the same in my grid. Once, Sara Tasker from Me & Orla helpfully described this as cleaning up the house before guests arrive. It’s still your house, not a display-home, but you’re putting your best foot forward. Through this process, I’ve kind of honed what it is I like about a picture, and what I don’t. For example, I’ve realised I’m always happiest when there’s some sort of nature or greenery in a photograph, and I always prefer cold rather than warm light, so that comes through. Helen your feed with your fantastic notes and doodles helped me improve the way I shared my illustrations and mail-art. Inspired by you, instead of just sharing plain envelopes or illustrations, I started to put them in context, showing works in progress, cups of tea and plants, and other elements of my life and home that informed my art and punctuated my days. You can definitely tell when I started styling my feed. It was about 12 months ago, in November 2016, when I took The Insta Retreat, an Instagram course by Sara Tasker who I mentioned above. I really loved that this helped me see how I could improve my photography, styling and storytelling, without becoming fake or corporate. I’m definitely on a big learning curve but that’s what started it all, and if you scroll back you can really see me start to experiment with different photographs and styles, and hone things like white balance and colour palette and composition (that’s all still a work in progress – some days I do it a lot better than others!). Nowadays the story of my feed is a genuine celebration of everything slow-living. Right there on my grid, you can see my experiments, both successful and otherwise (albeit artfully styled), in seeking ways to find peace and mindfulness in my busy days, to inject more creativity into my life (and help others do the same), and to lessen my impact on the planet. How has your account evolved over time? It has gone from private experimentation with editing and filters, and a personal quest to find joy in an unhappy place; to what was essentially a family album documenting the early years of my two babies; to what it is now, a conscious visual representation of my work, life, and the things I truly love. The two things that drive me about Instagram every day are inspiration and community. I’m inspired by the photography I see on there, and it helps me want to do better with my own work and photography. Likewise I hope to inspire other people to try new things in their creative lives. Alongside that, the community I have found on Instagram has become incredibly important. Unlike anywhere else on social media, I feel like Instagram is a warm, supportive place, and somewhere that has enabled me to find “My people.” I have made genuine friends from this platform and for that I’m forever grateful. I’m certainly not immune to the likes and follows, and I wouldn’t be human if it didn’t make me feel good when people appreciate a photograph I’ve shared, or follow my feed. But I do try and remain as level headed about it as I can. I know the shots that get me the most likes, but those shots (mail-art of succulents, for example) are not the only aspects of my life that I want to share, and I won’t compromise the whole of my story just to follow the likes. If I catch myself getting too caught up in the like-and-follow game, I take a little break from Instagram. I quit Facebook, Twitter and LinkedIn years ago, because they were more negative than positive in my life. Instagram is all I have so if it stops being friendly, inspirational and fun, I’ll stop doing it. How has Instagram impacted other parts of your life? There’s definitely an element of my photographs pre-empting my real life. So if I’m staging a flat-lay that’s gentle and peaceful, but all around it (out of the shot) is clutter and chaos, I realise I like the photo better than the reality, and that prompts me to clean up and calm down. Because I’m on a quest to slow down, I follow a lot of other accounts where people are on the same journey, and this definitely helps inform my choices and lifestyle. Likewise, perhaps more obviously, I find inspiration for my paintings in what other illustrators and artists are sharing. What opportunities has it brought you? Since taking Instagram more seriously about a year ago, I’ve loved how my feed has improved, and I have been really lucky that people started to notice. My following began to grow, and those followers were “my tribe,” the sorts of people who genuinely like what I am creating, and were often the same people who inspired me. A number of opportunities have come my way since then, including opportunities for illustration commissions, media articles, and a community of people who first inspired and then later supported the various e-courses and products I’ve been producing. These days, whenever I have a new creative idea, I take it to my Instagram community first to test it. They tell me what they think of it and, so far, their wisdom has never failed me. Thank you so much, Naomi, for your fascinating answers. I've loved discovering the story behind your Instagram feed.